YSR Congress party MLA Roja has been criticized for commenting on the comments made by AP Minister Devi Neni and chandrababu that YS Jagan was unable to stand up to the Prime Minister Narendra Modi, who gave the soil and water to Andhra Pradesh. 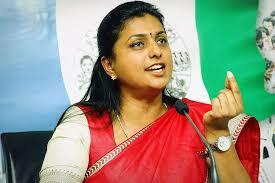 On Monday morning, Roja spoke at the opening of the YCP 'Vachanna Deeksha' in Visakhapatnam. When Narendra Modi came and gave clay and water, the pics were not there,Chandra Babu who took them both hands with great hands If Chandrababu is one waste fellow , she has criticized Devi Neni next to him. While laying the foundation for the state capital, the leader of the Opposition has not been called up and said that people know who they are without shame. Questioned. Rosa said that the time has come for the sins of the TDP. No one in the scandal of Chandrababu's scandal has been prosecuted, but he should have been in jail for the rest of his life. He said that people who were cheated by him were shattered and another conspiracy was open to the people and that the people knew about the incidences of Chandrababu masapupu. The event was attended by several MLAs and leaders including the MPs VijayasaiReddy, YV Subbara Reddy and Avinash Reddy, Botsa Satyanarayana, Ambati Rambabu and Bhimana Karunakar Reddy. This will continue till 7pm.